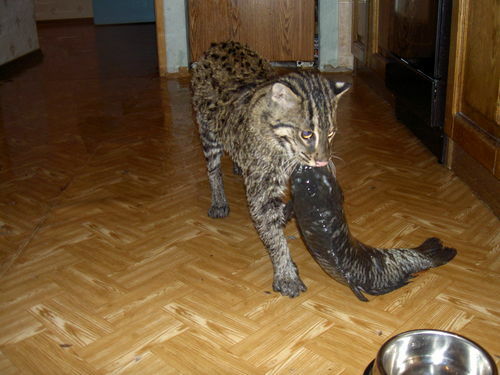 Fishing Cat: In Russia, cats eat you! And huge fish in the tub! Fishing Cat made the rounds a while back and I coulda swore I blogged it but I have no record of it on this blog or in my email. Luckily Kalman fished it up (you see what I did there?) and reminded me of this insanity. I kind of want one. Доброе утро! I am name Svetlana. 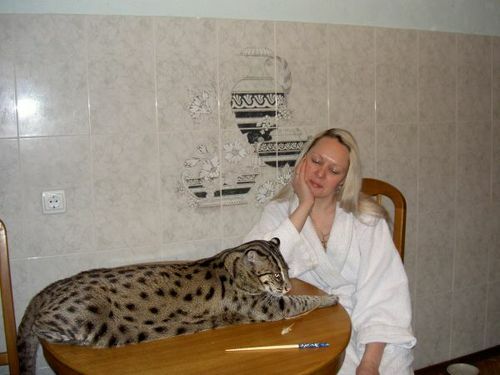 I have giant Fishing Cat pet, also kitchen table in my bathing room. I am also having ordinary cat pet too. Him name is Bulochka. Bulochka is meaning Little Roll, or White Loaf. Bulochka I am feeding Fancy Feasts. But Fishing Cat pet I am feeding living chicken. I am living in Kiev but do not misunderstand that this is Chicken Kiev. Chicken Kiev is having breadcrumbs on him. 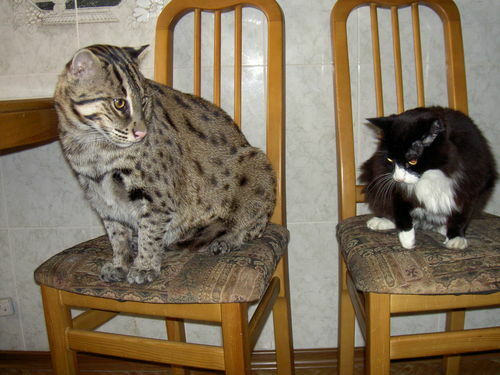 Fishing Cat pet is looking like several ladies after spectacular cushion fight! 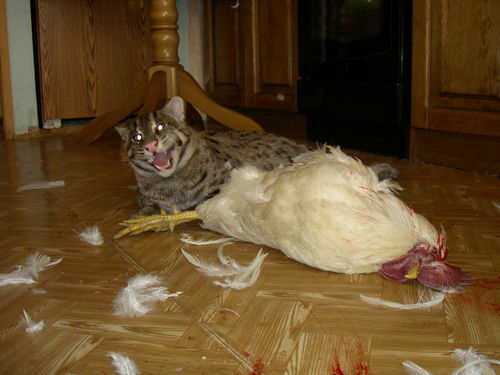 Fishing Cat pet is loving chickens but superlative to all Fishing Cat is loving fishing! 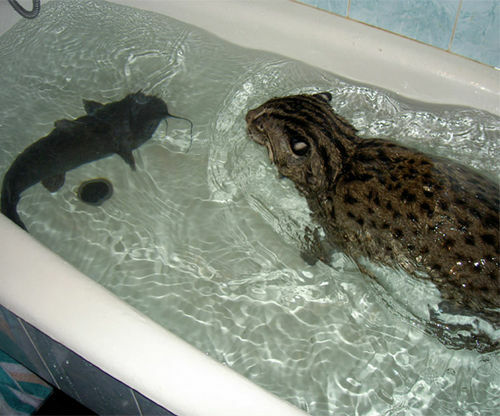 Бра́во, Fishing Cat pet! Бра́во! After catching fishes, sometimes Fishing Cat pet is bring to owners and lay on bed cushions with proudly! 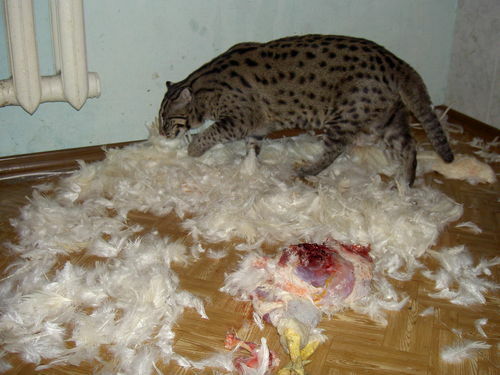 My husband Pavel never say Svetlana is like cold fish in bed after this!!! Dosvidanya from Pavel, Fishing Cat pet, Bulochka, and I, Sveti!! Good Speed! I never really conceptualized Fred’s tunic as being a furry pelt. I guess it’s obvious it would be, but I just never saw it that way when I watched the cartoon. I was also a very dull child who believed that the way to tell time was to take whatever numbers the clock’s hands were pointing at, and add them together. It was 24 o’clock a lot for me back then. Little Miss Sunshine: Great Hallowe’en costume idea! How’s this for the cutest little Hallowe’en costume ever? Olive from Little Miss Sunshine. Fashion Under $100 put together some inexpensive online sources for all the costume bits. I’m not being Olive, but maybe you should. Particularly if you’re a guy. 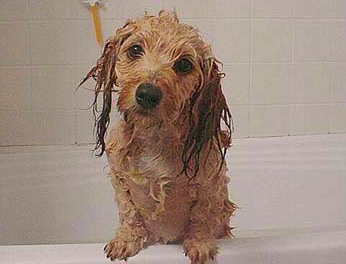 Also, I have NO IDEA what to be for Hallowe’en this year. I feel some pressure since my costume last year was the bestest. Any suggestions? Mad Men: Prop master Scott Buchwald, interviewed. Mad Men is renowned for its beautiful and accurate period production design. Propmaster Scott Buchwald is the guy who makes it happen. There was one time when January Jones defrosts a Sara Lee cherry cheesecake. The cheesecake wasn’t hard to reproduce, but we had to make the box that it came in. Getting the Sara Lee logo from 1960 was easy, but finding an actual cheesecake box was hard. Again, that’s not very collectible. Pretty much the second after the cake was taken out, the box would have been thrown away, so I looked through pictures of kitchen scenes, hoping to find a cherry cheesecake box sitting there. After looking through 3,000 pictures, I was able to capture every angle of the box and I was able to redraw it on Illustrator and tweak it on Photoshop and then print it out and rebuild the box. Here’s an interesting interview with Buchwald. 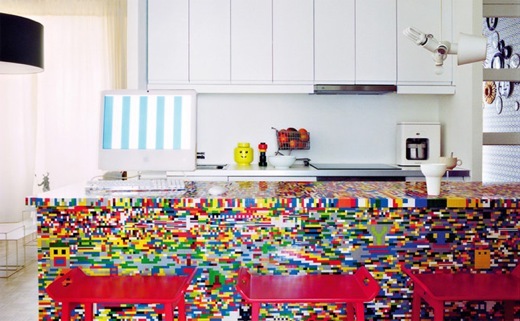 A kitchen counter made of 20,000 Lego bricks. 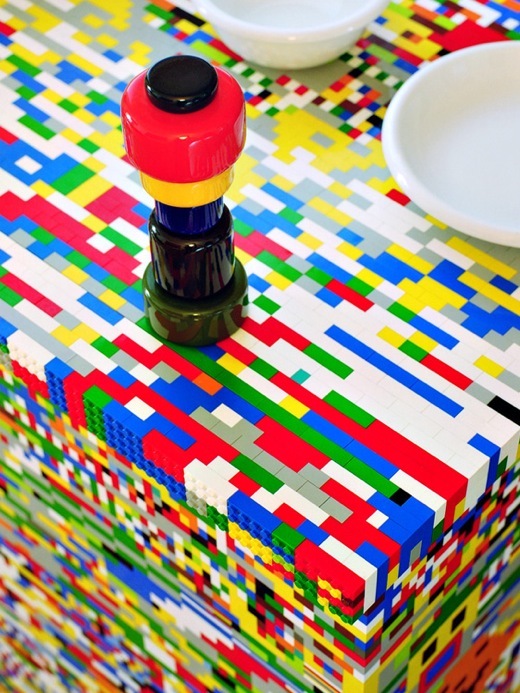 Notice the little Lego head sugar bowl in the background? Thanks to the lovely Julie F for finding this! Almond milk is delicious. Those almond calves are lucky little buggers. How to make almond milk at home in the blender. Looks pretty easy: recipe here! You are currently browsing the pageslap blog archives for October, 2009.